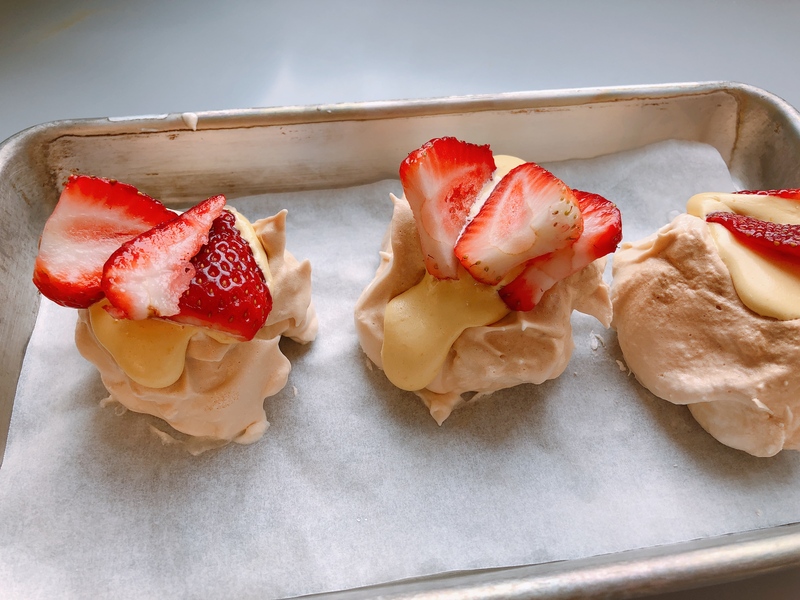 This delicious desert food is an Italian baked Meringue that is served with a warm custard called Zabaglione at the center and then topped with fresh fruit. 2. 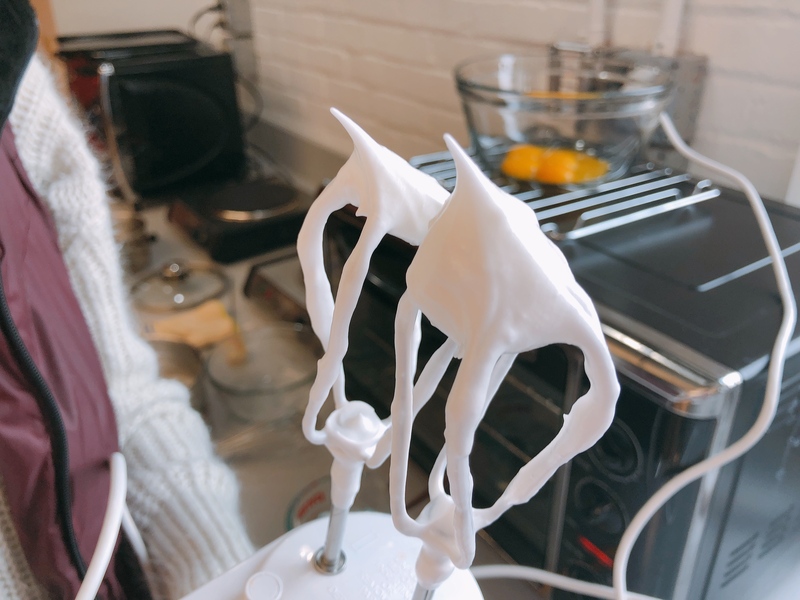 Place the egg whites in a stainless-steel bowl and beat with an electric/hand mixer until foamy. 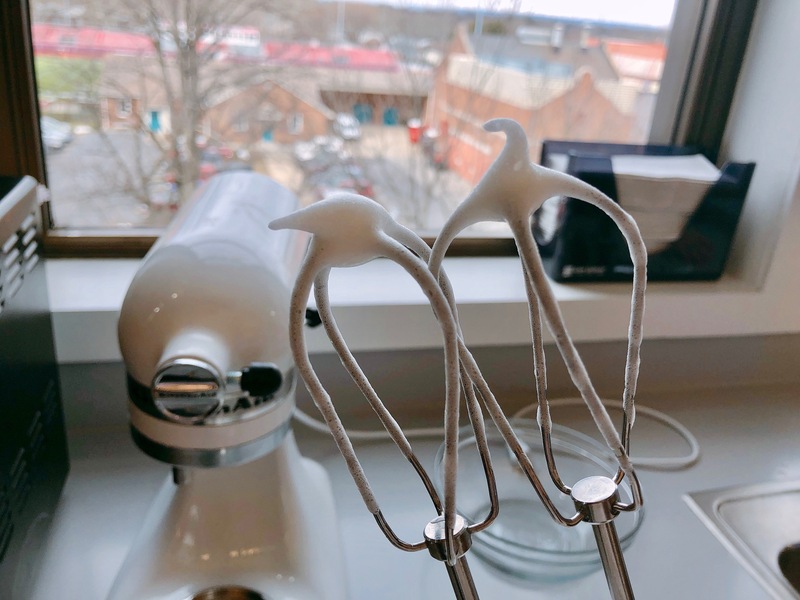 When we made this we used a Kitchen Aid and whisk attachment. Then add the cream of tartar and beat until soft peaks form; they should flop over like below. 3. In a small pot over low heat on your Waring burner, combine the sugar and water. Stir carefully to dissolve the sugar completely. Put the oven glove on your hand and use the kitchen thermometer to check the temperature. 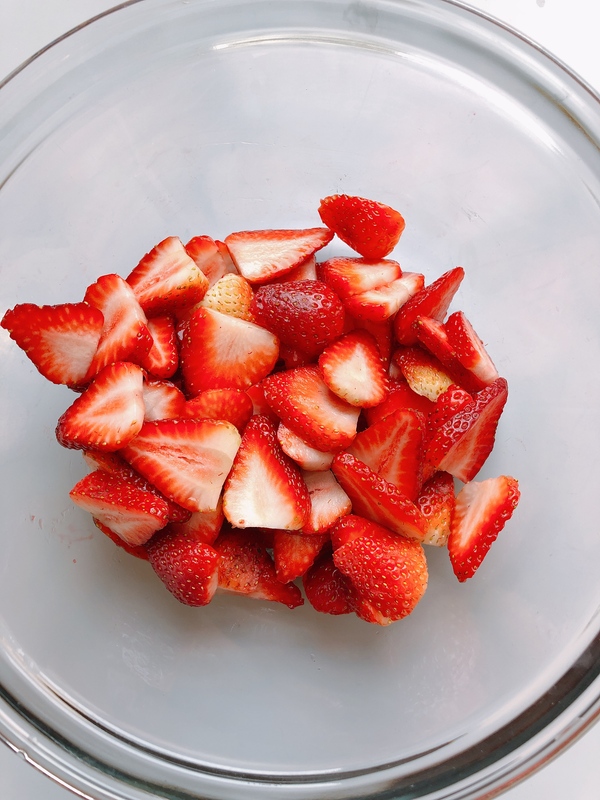 Increase the heat and boil the sugar water to 236-240 degrees F – or the soft-ball stage. With the oven glove on your hand, scoop some of the syrup with a spoon and drop into the cool water. This small sample of the cold syrup should form a soft ball when dropped into cold water like pictured below. Fix the thermometer to your saucepan so the thermometer is near the bottom of the pot but not touching. 4. Start the mixer again and pour the hot sugar syrup in a thin stream over the beaten egg whites. Beat until the egg whites are stiff and glossy, they should stand up straight as pictured below. 5. Line two baking sheets with parchment paper. 6. 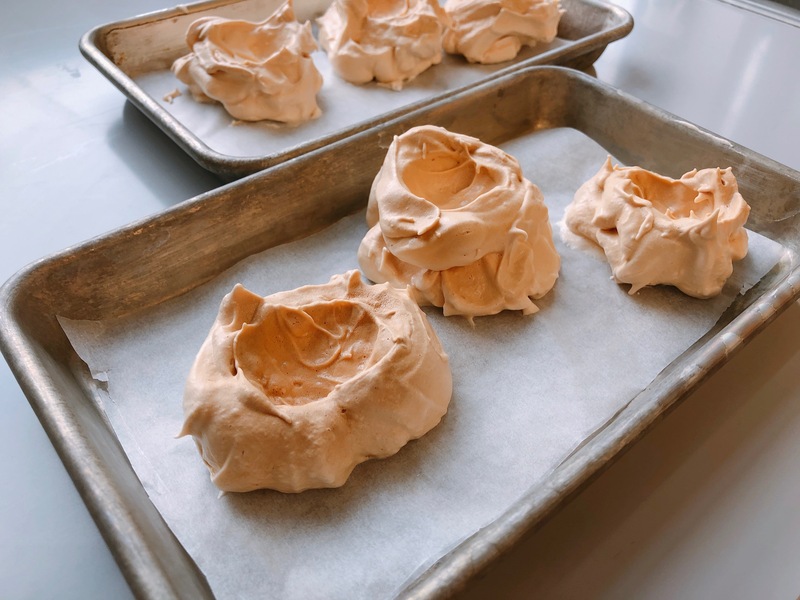 Scoop spoonfuls of the meringue onto the parchment lined baking sheet and shape into cups or tarts using the back of a spoon, then bake for about 40 minutes at 300 degrees. Then shut the oven off and leave the meringue shells in there for another hour until they are dry and airy. 7. When the meringa are 45-50 minutes from finished proceed to making the zabaglione. 8. Remove the meringa tart shells from the oven when they are lightly browned and dry and allow them to cool. 1. Put an inch or so of water in a clean, medium saucepan. Cover with a lid and bring it to a boil, then reduce heat and maintain at a simmer. 2. In a glass or stainless-steel bowl that will sit on top of the sauce pan without falling in, whisk together the egg yolks, sugar, and almond extract. 3. Place the bowl on the saucepan and whisk constantly while the mixture heats. This process takes a lot of time so make sure to not overheat the zabaglione. The signs to look for that tell if the zabaglione is done are if the mixture starts to come away from the sides of the bowl, the mixture mounds easily, and when you run a whisk through the mixture a trail is visibly left behind. Once it is done take the bowl off the heat and into a bowl of cold water, and keep whisking to further thicken the zabaglione. Then place the mixture in a bag that will allow you to squeeze the mixture out onto the meringa. 4. Proceed immediately with the still hot Zabaglione to assembling the tarts. 1. Put a meringa on a plate or small bowl and pour warm zabaglione over it. View our video discussing how our Meringa con Zabaglione and how it went when we made it! 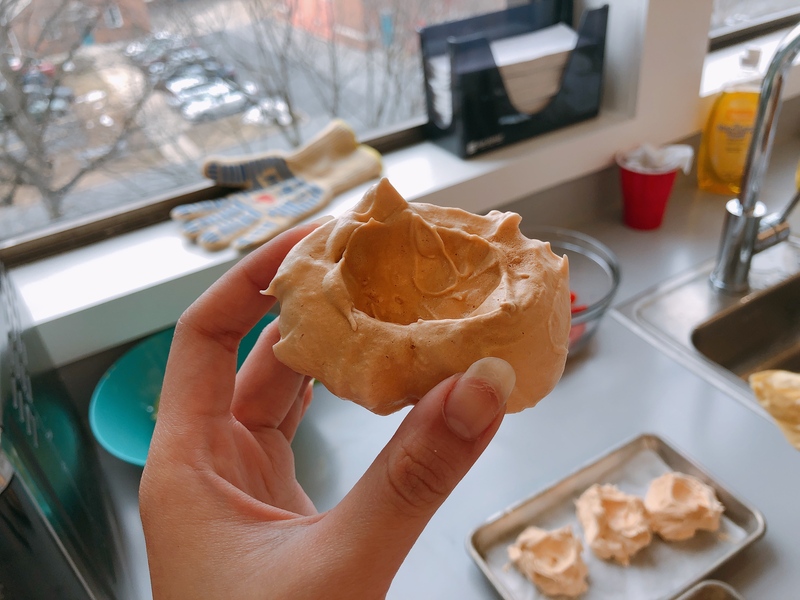 What chemical changes occurred when you made the meringue/meringa? What did you observe that told you these chemical changes were happening? 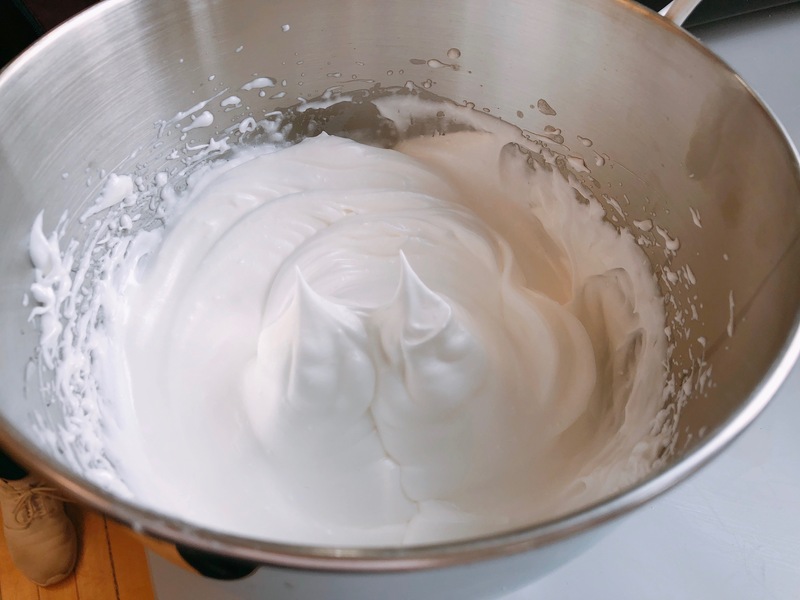 When making the meringue there were many chemical changes that occurred but they all had to do with the denaturation and coagulation of the proteins in the food. When we separated the egg whites and then whisked them together in the kitchen aid this is when the egg proteins began to denature. This is also in part because of the air that was being put into the mixture. This mixing then caused the proteins to coagulate and the egg whites turned from being a clear substance to a white foamy mixture. This was even further coagulated when the cream of tartar was added. 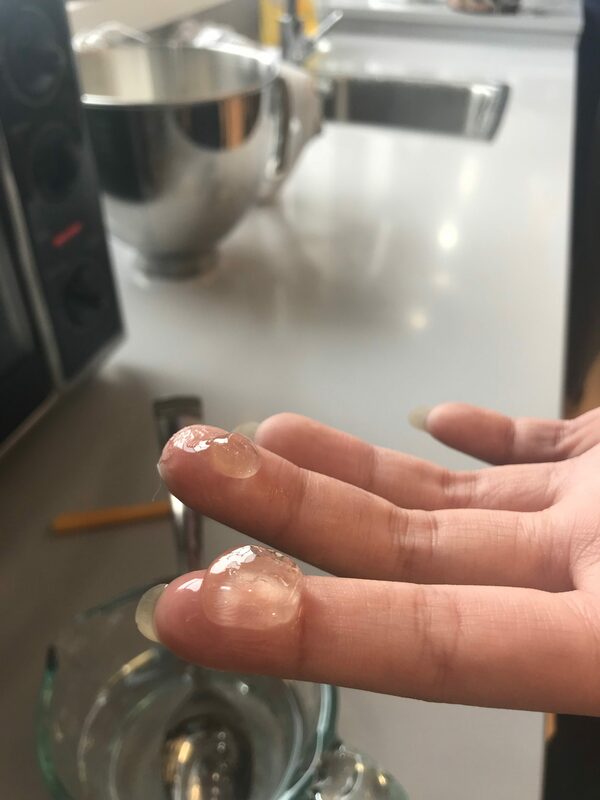 Once the hot syrup was added more denaturation and coagulation happened with the proteins and this was seen when the soft peaks became stiff glossy peaks. Finally cooking the meringue caused for more coagulation and this was seen when the meringue hardened from being in the oven. What was responsible for the thickening of the zabaglione as you stirred it over the hot water bath? The thickening of the zabaglione is due to chemical property of the proteins in the custard. When the denatured proteins are heated they coagulate and causing the thickening to occur. 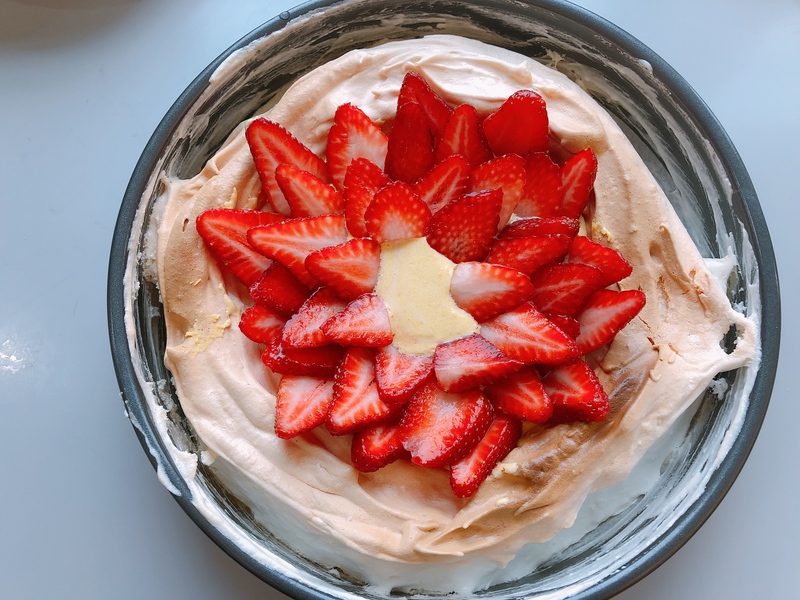 The zabaglione’s proteins were denatured from beating the eggs and then were coagulated from heating and stirring the mixture together over a long period of time. By doing this the proteins came together to create a new structure that became the new thickened and cohesive custard. Overheating (too fast and or too hot) the zabaglione can leave you with “scrambled eggs” – a lumpy grainy mess of clumps in watery liquid. What is happening in this case? 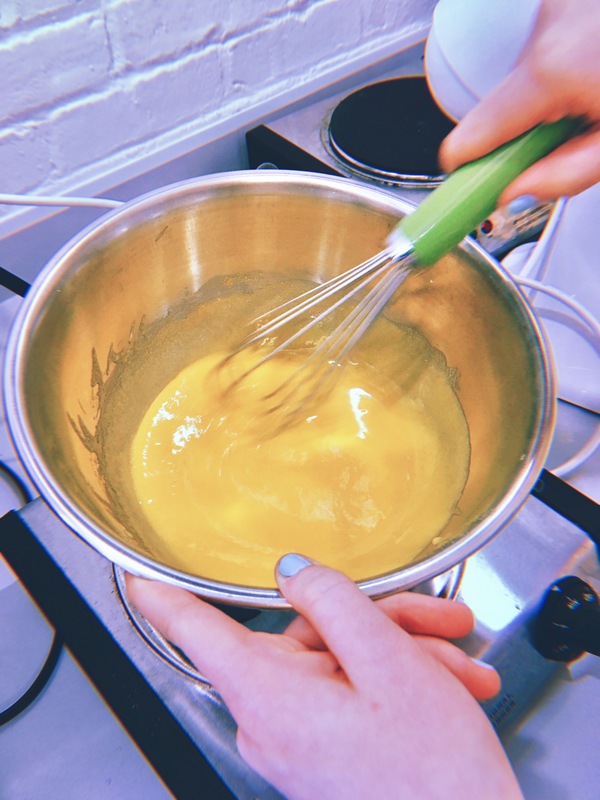 The egg that is in the zabaglione is being cooked at a higher temperature and if there is too much heat and not enough stirring the proteins that are present in the mixture will be heated too fast. This causes the hydrophobic molecules to clump together and cause this separation from the rest of the mixture. They will start to clump together creating these “scrambled eggs” in the custard. Your custard looks really good! Our custard was too thick so it was almost like a thick paste. Also your meringa browned nicely. Great job. Very nice meringa! You did a great job getting stiff peaks. Your post is really well organized and easy to follow, and your final product turned out great. Great work!